This is The Digital Story Podcast #646, July 31, 2018. Today's theme is "Sony RX100 VI: You Can Have it All" I'm Derrick Story. A subcompact camera with a 1" sensor is a luxury indeed. 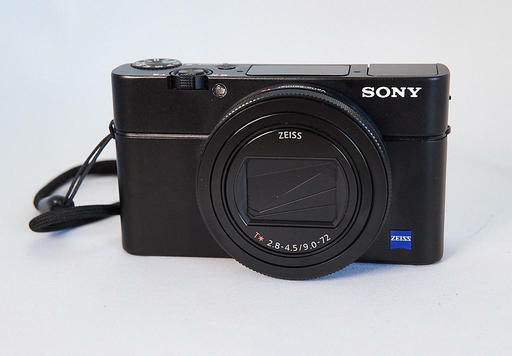 And for that reason alone, the Sony Cyber-shot DSC-RX100 VI Digital Camera is worth a look. But then add a relatively fast Zeiss Vario-Sonnar 24-200mm zoom, popup electronic viewfinder, and 4K video recording, and you have to ask yourself, "What the heck is going on here?" We're going to answer that question in today's TDS photography podcast. There is a lot to like about this camera... so much so, that it would probably take me two more articles to cover all of the stuff that I didn't get to here. And if you're looking for an ultra-compact all-in-one capture device, it's going to be hard to find a more capable machine. That being said, the one thing that was missing for me was the physical experience of holding a more substantial camera. In other words, I missed the feeling of taking pictures with a camera that feels great in the hands. ... except for the one thing that I haven't talked about yet: its cost is $1,200. On one hand, it's totally worth the steep price tag. Combine the features, image sensor, and exceptional zoom lens, and you have a deluxe package that should command a premium price. But the fact of the matter is, $1,200 is a lot of money for a compact camera. And if you invest that amount of money, you'd better get your shots out of it, and that means using it more often than just during travel. Read the full review! "The Sony RX100 VI - A Compact Beast" - The RX100 VI is a pricy, no-holds-barred compact camera. Does its extensive feature set and fantastic image quality justify the price? Here's my take - http://thedigitalstory.com/2018/07/Sony-RX100VI-review.html. So, then, what is the answer to the question: Is it worth it? I can say, "Yes it is." But, is the Sony RX100 VI for you? Well, that depends on your credit card balance, disposable income, and yes, the most important person in your life who might see you using it and ask: "Oh, that's a cute camera. How much did it cost?" F-Stoppers reports: "While the pocket-sized camera is clearly ideal for travel, the NA-RX100 VI housing is just as practical. Weighing 2.3 pounds (1.05 kilograms), you'll be happy to hear the system will take up very little space and weight in your carry-on or checked baggage. If you like deep dives, the underwater housing can be taken to a depth of 380 feet (100 meters). It's a nice selling point, but how many divers go to such depths? The housing ships with a standard interchangeable port, which was not found on earlier versions of the Sony RX100 underwater housing line. The standard port allows use of the full zoom range -- up to 200mm -- and can be equipped with the M67 Flip Diopter Holder, which allows photographers to add the SMC-1 Super Macro Converter for shooting the tiniest ocean critters. The new NA-RX100 VI is priced at $1,100 and is available to order now through the Nauticam website. On the June 11, 2018 TDS Podcast I mentioned that "I'm Taking the Canon PIXMA PRO-100 Rebate Challenge" and had mailed in all the required documents for my $250 rebate. And I'm happy to report that I now have my rebate. Here's the final chapter. DP Review reports: "Following an earlier leak, Nikon has officially started the clock on a countdown to its upcoming 'special event', widely assumed to be the launch of a new mirrorless system. The timer is counting down to 1pm, on the 23rd of August (Tokyo time). That's midnight in New York, 5am in London and 9pm on the previous day for the DPReview office here in Seattle." Do You Have a Film Camera that Needs a Good Home? Over the last year, I've received donations from TDS members who have film cameras that need a good home. What I do is inspect the items, repair and clean as I can, then list them in TheFilmCameraShop where I can find a good home for them. If you're interested in donating, please use the Contact Form on TheNimblePhotographer site. And thanks for you consideration! Thanks to Bill Armon, and others who have previously contributed their gear to TheFilmCamerasShop. I've updated our Directory to Portfolios by TDS Photographers page. Stop by and see what your peers are publishing. You can become a member of our Inner Circle by clicking on this link or by clicking on the Patreon tile that's on every page of The Digital Story. Portfoliobox - Create the site that your best images deserve by visiting Portfoliobox. And get a 20 percent discount by using our landing page!